In 1981 I interviewed Michael McCreary, owner of Miramar Surfboards, then the only surf shop in Half Moon Bay. Miramar Surfboards was located along Highway 1. 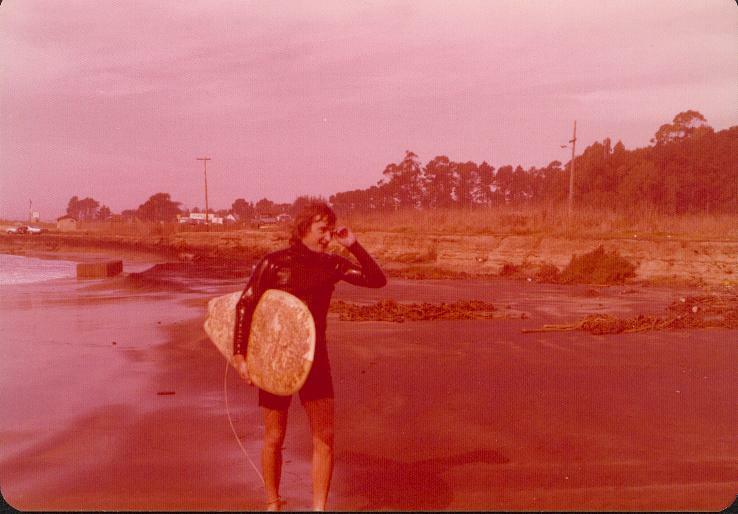 At the time Michael had surfed for 17 of his 33 years. June: What is it about surfing that gets people hooked? McCreary: People enjoy surfing because it’s a natural sport. There’s no engine,no sail, no ski-lift. Just you and the surfboard. Another thing that attracts people to surfing is that surfing conditions arealways changing.There are so many variables. It’s always different. June: When can you catch the best waves around Half Moon Bay? McCreary: Half Moon Bay is really good between September and March. The reason waves are good in the fall is because we get off-shore winds from the east. East winds made ideal surfing conditions. Not Mike McCreary (but I sure would like a pix of him) but Jim Rafferty, a former Woodside resident, who spent a lot of him time on the Coastside surfing at El Granada Beach, seen here. Twenty, thirty years ago hardly anybody came out to El Granada to surf. You could even cross Highway 1 on foot without running to avoid being crushed by a car because hardly anybody knew of the place called El Granada. June: Tell me where I can surf around here. McCreary:There are several spots at Half Moon Bay for both beginning and advanced surfers. Surfer’s Beach, south of the Pillar Point Breakwater, is considered ideal for beginning and intermediate surfers. It’s a small spot sheltered fromthe ocean. The swell wraps around Pillar Point, and loses some of its strength breakingup on the reef off Half Moon Bay. There’s not too many dangerous currents. You can surfall year ’round at Surfer’s Beach because prevailing winds come from the northwest. McCreary: More advanced surfers prefer Venice Street, Kelly Street and Dunes Beach between Kelly and Venice. Ideal waves reach six to eight feet in the more advanced surfing spots. June: And the biggest waves you remember? McCreary: Last winter–the biggest swells since 1969. I’d say the swell got up to 20-25 feet. Nobody goesout when the waves get that big, though. You have to drive to Santa Cruz or Monterey if you want to surf. June: Is there a surfing code? McCreary: There aren’t any written regulations but there is a kind of peer pressure. You go out and do whatever everyone else is doing. But one cardinal rule is that the first person who gets a waves has the right-of-way. You wouldn’t want to take off in front of him. That would be rude. McCreary: When you fall off a surfboard the best thing to remember is not to try to get the surfboard between you and the wave because once the wave hits the surfboard,it hits you. Always try to duck under the wave or the board.